Children who have a love and knowledge for music have a slight intellectual advantage over their friends who do not. Music can actually help kids learn all different subjects faster. If you or your spouse it a musician, great. If not, there are plenty of resources to give your child – and yourself – some beginner music lessons. This app will bring the world of music to your child through your iPad. 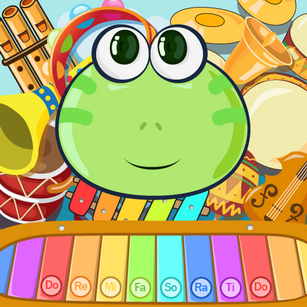 Children as young as 9 months old can enjoy the 14 instruments and 5 music loops. Instruments include drum, xylophone, guitar, saxophone, flute, piano, violin and more. Loops include Classic Guitar Loop, Authentic African Drums, Heep Banjo, Majestic Grand Piano Cords, and Cool Drum Beats. Your child has also learn vocal notes with the Do, Re, Me song. $2.99. 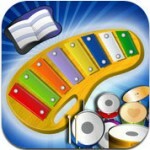 Your child will learn how to play different musical instruments, as well as learn more about music with this app. The piano, drum, bongo, tambourine, hand bell, maracas, triangle, and percussion are among the instruments featured. When your child plays the piano, the faces of the animals will change. The song list includes Are You Sleeping, Jingle Bells, Joy to the World, Old McDonald, Three Blind Mice, and more. $0.99. Release your child’s inner Mozart with Moozart. This app brings music together with your child’s favorite farm animals. 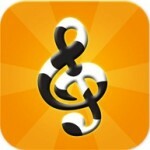 Children can create endless music variations with this app, which is described as a “barnyard-themed music creator”. Drag icons of the animals and other farm objects and place them on the musical staff to make beautiful music. Children can use the app’s sounds or create their own. The adorable graphics and sounds make this app perfect for children of all ages. $1.99. 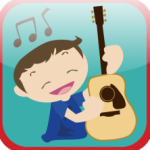 This app is a fun way for kids to learn how to play the guitar. 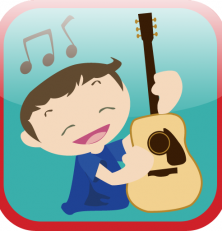 The app’s character, Kasey, shows kids how to play along with simple music recordings. 17 songs are featured from all different genres, including pop, rock, hop-hop, country, bluegrass, reggae, and jazz. The music was professionally recorded and the app is designed to teach children through imitation. Each song has lyrics the child can read or listen to, then the song is played and the music notes are at the bottom. $9.99. Entertain your child for hours with all of the musical buttons on this app. 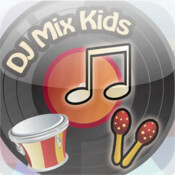 Children can mix instruments and sing along to the background music. It also features fun sounds and a DJ scratch disc. Record your child signing and making music to replay. The song list includes London Bridge is Falling Down, Itsy Bitsy Spider, Yankee Doodle, If You’re Happy and You Know It, Pop Goes the Weasel, and more. 15 fun kids songs in all. $0.99. 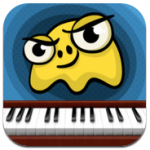 With this app you can use your own piano or the one on the app, which has real-size keys. 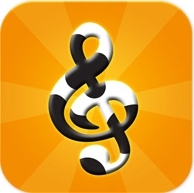 The app actually listens to your piano to assist in teaching musical skills. Your child will also learn note names, rhythm, and how to play songs. Many free songs are included and new songs are added through updates. The high quality concert music is meant to accompany your child’s playing. The app has adorable graphics and songs including Mary Had a Little Lamb, Chopsticks, Oh Susanna, and even What Makes You Beautiful by One Direction. Free.